Trimpo is a unique integration service to kick-start merchant sales across global marketplaces and the first blockchain-integrated marketplace. Trimpo provides merchants with a single-point access to global marketplaces. At present - to eBay, Amazon, Etsy, and VK social network. Easy and convenient setup allows one-click seamless integration of merchant CMS. Over 23,000 merchants have signed up since the service launch in January 2017, and the number is expanding by 30-70 per week. The team brings together seasoned professionals, with several decades of experience in IT, e-commerce, and finance at eBay, PayPal, Wikimart, Barclays, ICICI Bank, Sberbank. We envision Trimpo as a blockchain-integrated e-commerce ecosystem. It started in early 2017 as a platform for merchants to manage their products and sales on global marketplaces (eBay and Amazon, on social network VK and on Yandex.Market) from their Trimpo account, as well as to create price lists for CPC/PPC sales channels. More than 23,000 merchants are already working with us, offering 10 million products. The number of users is growing by 30-70 per week. Over 1,000 merchants work with Trimpo directly via their CMS (Content Management System), which significantly simplifies the integration, the process of starting sales, and dataflow. 4. Launch Supplier and Data components and Trimpo Marketplace to complete the foundation of a fully functional, sustainable and growing marketplace ecosystem. Investment in Trimpo ICO offers three channels to make money. First, ICO bonuses: up to 50% at the Pre-Sale and up to 40% at the Main Sale. Second, growing token usage within the Trimpo system. Tokens will be used for purchases at Trimpo marketplace, payments within the customer loyalty program, commission fees for merchants, and service fees for suppliers. This will maintain growing demand - and boost the value - of the tokens. Third, a quick build-up of Trimpo turnover. With global e-commerce growing 20-40% per annum, Trimpo intends to capitalise on this and to capture a growing share of the market. The latter will be ensured by constantly expanding the list of marketplaces accessible through the Trimpo platform and by building up the Trimpo Marketplace. The focus on product development will allow to quickly expand the merchant base, which will be accelerated by investment in marketing. Trimpo is different from most other ICOs in that it is a working solution already, gaining recognition and usage within the merchant community around the world without the marketing spend. The road map, game plan and team build up are clear and realistic and achievable. And most importantly, the ecosystem is self-sustaining, well positioned for growth and inclusive. Very good 'thoroughbred' core team. The founder comes from one of the best technical universities and he has put the right team in place, all with relevant experience and a long learning curve of working together. At this project stage it is remarkable. The vision is a little worse articulated than the roadmap. But the charts and graphs are self-explanatory and the .org site is clear. All major building blocks seem to be woven into a doable plan. I am delighted to note that the project is in its youth stage already with more than 23K users. It clearly shows there is demand for the product. It also gives me comfort that this project will be successful unlike most others, and will further ride the wave of e-com growth. I was also happy to see the 'i-word' - inclusion, because that's what it's all about. The product seems to simplify the lives of merchants and the default marketplace settlement in Ether is brilliant because it would work well not only in the b2c and c2c, but also in the B2B space. It does not emulate others, but rather builds on them. The offer of data and data analytics to system participants is great; it provides agility to sellers, easing oversupply across categories. And the global reach and ease it gives to any store that wants to go online can be phenomenal. I wish these chaps will address painful issues like timely overseas deliveries and provide some finance wisdom for global trade flows. Areas for improvement: articulate the vision a little better, improve the WP, bring in more advisers from the markets earmarked for integration. Very interesting idea and good vision. Marketplace and services to kick-start sales need for all market. MVP avaliable also and it's good. Maybe need add more advertising and marketing in future. About team it's dedicated and vision is quite good ...... About product they already have mvp and make partnership with many good company have great bright future of this project. Team low rating as I find it strange that with 23,000 metchants all adminsiatration is outsoured and that is also the plan at the smaller raise level which woudl suggest this is a purely dev project. This doesnt seem to tie in with the org chart I would expect for a company with this level fo activity already and growth and a risk. Not sure why early investors get 5% , wont they make their return via equity and dividends as token hoders will not share in any profits and the invetsors also have a resevrve to raise more undllutive funding benefiting equity holders. 30 to 70 a week seems low compared to 23,000 in 16 months. On the rate of merchant acquisition. We have managed to attract quite a large number of merchants at the initial stage of project development using our contacts. Besides, the project clearly holds an appeal, helping us to steadily attract new merchants. Currently, we do not conduct active acquiring, while we highlight this as a primary destination for the ICO proceeds. On merchant administration. We have been focused on building a critical mass of global marketplaces to make our service attractive to a broad merchant base. As we gain momentum, the focus shifts to merchant services. Including supplementary services (logistics, marketing, sales analytics, etc.) and client management. Currently, the platform is administered by three members of the team; we do not outsource anything yet. On our strategy. This project has originated from complexities of different marketplaces. 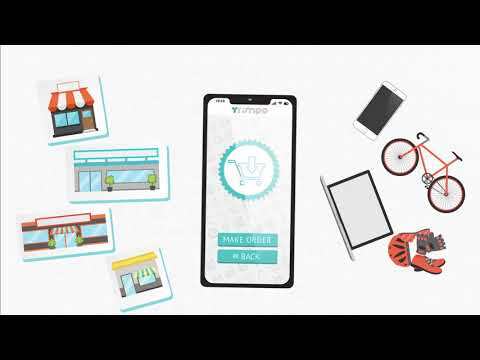 We have launched this as a helping tool for merchants. We maintain our focus on building a comprehensive offer, in terms of marketplace access, in geographic reach, in supplementary services. We currently offer our product to merchants for free and do not intend to start charging them until a critical mass of marketplaces is connected and tested. Even then, we intend to be priced quite humbly compared to the e-commerce majors. The ICO proceeds will help us to accelerate this process. On 5% early investor bonus. In the ICO, we focus on retail crypto investors, from the early adopter community. No equity stake is offered at this stage. We also view this approach as a test of consumer interest in crypto denominated e-commerce. Strong team with brand name commerce experience. 23,000 merchants is an impressive number but the key will be user adoption. If you bring the users the merchants will come. This is not financial advice. Or a recommendation to invest in this or any other ICO. Do your own research and do not rely on external ratings to make your final investment decisions. ICOs are risky and 100% loss of capital is possible. In my opinion this is a very interesting project, that has a good team/advisors. Appears to have decent flow of new users every week. This is a very good-looking project that has some of the key components that I like - a strong, well established team, a great centralisation vision within the decentralised ecosystem and a product that has been integrated & tested with a global leader in the industry. The advisory board could use a little more bench-strength - the target hardcap means the project will need to gain a substantial and wide-spread adoption across the market and a good network will be vital for the overall success of the project. Many companies are working to reduce friction in eCommerce. Most have decided that a blockchain platform is needed for a new ecosystem. A few will succeed and make a lot of money on the volume created by better access and velocity. Will Trimpo be the lucky one? An innovative vision which is backed up by an experienced team. The idea itself is quite interesting and a great example of how blockchain can be used to eliminate the middle man, and make things more transparent. During PreICO: +50% with any purchase. Decision to create project Trimpo. Launch of Trimpo’s basic platform. Marketplaces eBay - integration of ebay.com with Trimpo website. Marketplaces: eBay - integration with all eBay websites. Marketplaces: Amazon - integration with amazon.com. Marketplaces: Yandex - integration with market.yandex.ru. Social networking websites: integration with VK. Exporter system - export of products’ listings into platforms formats (Google Merchant, XML for Yandex, Excel). Integration with Country Marketplaces on Amazon. CRM system for Trimpo users. Registering as legal entity in USA. Integration with social networkinging website - Facebook. Integration with messengers - shops in Telegram’s channels. Integration with Marketplaces: Flipkart, Global.Rakuten, Walmart and others. Integration with messengers - WhatsApp and Facebook messenger.